Soap made from 100% Olive Oil is known as Castile Soap and is one of the gentlest soaps there is. Common Extraction Method: Cold pressed from the flesh of the Olive fruit. Physical Description: There are three commonly used grades. Extra virgin oil comes from the first pressing of the olives and is a lovely green colour. The oil you find simply labelled 'Olive oil' will be either the A or B grade oil. It is often a bit cheaper than the extra virgin grade and is light golden yellow in colour. This grade produces the whitest soap. 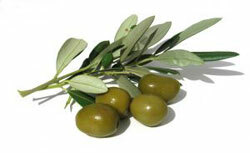 Pomace oil is the result of the last pressing of the olives and is quite green. It can also contain a fair bit of Olive sediment (Olive flesh). Aromatic Description: Has a mild, pleasant odour. Soap Making Characteristics: Even though Olive oil is a liquid oil, low in palmitic and Stearic acids, it does produce a surprisingly hard bar of soap. The lather is very conditioning but, unfortunately, it is also very thin (not bubbly) and tends to have a rather 'slimy' feel to it. I find this oil performs much better when combined with other oils. You can use any amount of this oil in a soap recipe. My usage usually ranges from 25% up to around 60% of the base oils. The extra virgin and regular grade oils are slow to saponify so trace can take some time to reach in recipes containing high amounts of these oils. Pomace oil, with its high percentage of unsaponifiable matter, will speed to trace, sometimes alarmingly so. Be very careful when using pomace oil with other quick tracing oils. Recipe Suggestions: You will find that pretty much all of my recipes will contain this oil. Check out the Soap Making Recipes page, the Basic Soap Recipes page and the Palm Free Soap Recipes page for ideas.